2012.06.12 - New evidence implies Maya astronomers possessed precise astronomy as early as 800 C.E. ... I noted a very precise ratio, 341,640.0 solar orbits to 4,225,659 moons, a difference of about four hours every four million plus full moons (1.0 : 1.000000001). 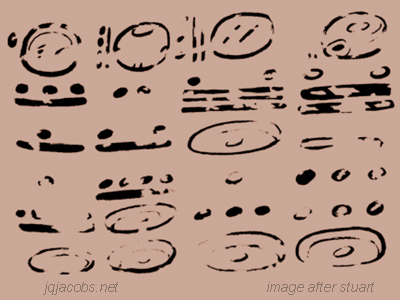 Is Maya research hampered by an assumption—that Maya Long Count numbers refer to day counts, not other intervals? ... more ... continued at Permalink. 2012.05.29 - I recently began incorporating Panoramio image links into placemarks, to enable reviewing the very best images and to visually enhance recording new data. Just open the KML text file in Google Earth and click the placemarks to display photo-illustrated balloons with the selected images from the application's Panoramio layer. Giant Buddhas, Rock-Cut Grottoes Placemarks, a file of monumental Asian art. Menorca Island, Spain. The placemarks research in this file was greatly facilitated by the previous work of Spanish archaeologist Ferran Lagarda i Mata. 2012.02.12 - Pi appeared while considering the arc distances between the largest Neolithic stone circles and Stonehenge. The pi numeric string expressing the ratio of arc distances between three sites previously occurred in relation to Stonehenge. 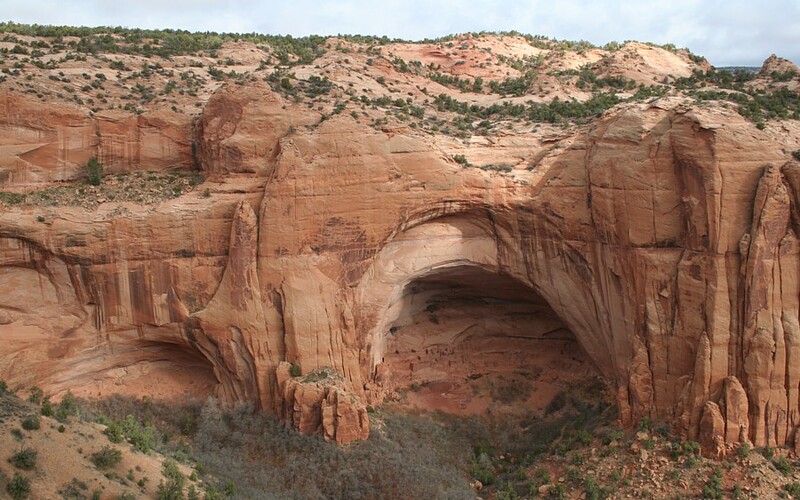 Pi has also surfaced when considering astronomy correlations and monument properties. 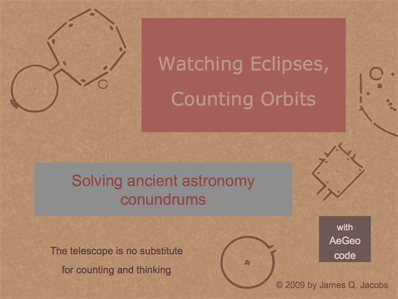 In this most recent instance, the accuracy of the ratio is so impressive a question is posed, "Did the Neolithic builders of the megalithic stone circles intend to express pi?" .... 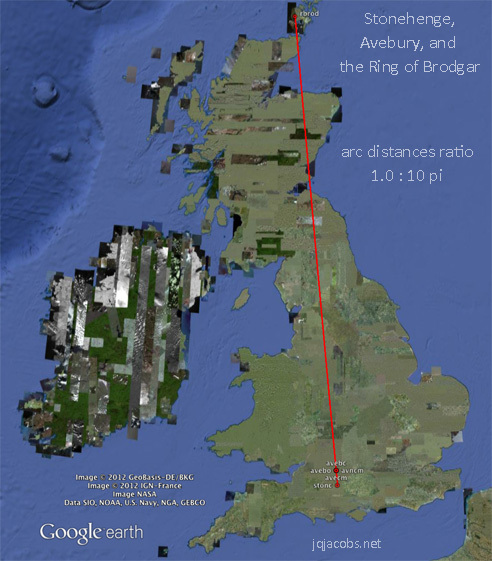 The arc distances ratio of 1.0 to 31.4168 caught my attention when Stonehenge, Ring of Brodgar, and Avebury were the three site variables .... The margin of error in determining coordinates exceeds the error factor in the hypothetical representation of pi. ... Permalinked on Pi Day 2012. 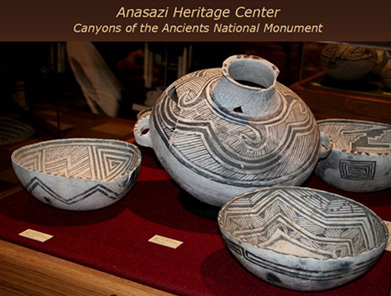 A dozen PowerPoints are in the SOUTHWEST Anthropology and Archaeology pages. © 2012 by James Q. Jacobs. All Rights Reserved.